As I sit at my grandmother's place in Lucknow, triumphing over the fluctuating net connectivity, I yearn for a strong cup of coffee and can't help but fondly reminiscence the cobbled lanes of Vienna and the elegant Kaffeehäuser (coffee houses). Our visit to the Austrian capital is still fresh in my mind and I find myself walking once again amongst its history, Baroque architecture and the musical geniuses of Mozart and Strauss. The imposing monuments in the city's historic center grab your attention immediately, yet there is also a very relaxed vibe in the neighbourhoods fringing the city centre as youngsters laze on design lounge chairs in the Museum Quarters or stretch their legs beside the Danube canal and enjoy a pint as music fills the air. As we boarded the train from Zermatt to Zurich, I couldn't help but feel a little heartache. Our serenade with the beautiful Swiss landscapes was about to end. This was no doubt one of the best travel experiences we had had, and we still had one more day to live it out. We reached Zurich just in time to rush to restaurant Le Dezaley which is famous for its cheese fondue. It was just minutes before the closing time but the staff politely ushered us in and we quickly got to ordering. 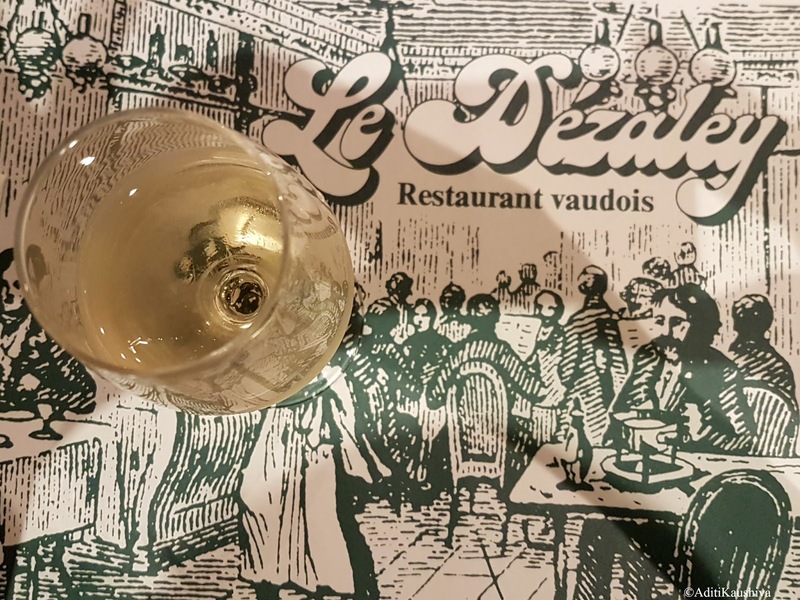 The cheese fondue was truly worth the hype and we also helped ourselves to one more dish and a glass of wine recommended by the staff. I have in my previous posts spoken of the efficiency and beauty of the Swiss scenic trains. The decision to thus spend a day on the classic Glacier Express, famous for being “the slowest express train in the world” (the 275 km journey takes about 8 hours) was an easy one. That unhurried summer morning we bid goodbye to the beautiful town of Lucerne, and headed to Chur to catch the Glacier Express. The Glacier Express connects the two major mountain resorts of St. Moritz and Zermatt, passing through three high-mountain passes, 91 tunnels and over 291 bridges. As we boarded the bright red carriages, I felt like I am in the middle of a movie shoot. The huge panoramic windows instantly call out to you and tell you to sit back, relax and enjoy the views of green valleys, gorges, pristine blue river and snow peaked mountains, all from the comfort of the train. I am not a plotter, not in my writing and not in life. I take each day as it comes, at the most making a to do list when the list of tasks become too lengthy to compartmentalize in my head. My travel plans too, are as detailed as booking a flight and a place to stay. In all our travels, we do get around to seeing the major attractions and walking the tourist route. But we often sidetrack and loiter around discovering, uncovering a new city in our own time. Of course, not planning has its pitfalls but they come with learning, with a knowing smile directed towards the husband telling him we better not repeat this mistake the next time, and it makes for a great story! We were ecstatic to wake up to a sunny day in Lucerne and a quick breakfast later headed to Engelberg, home to the famous Mt. Titlis. On top of snow covered mountains, everything makes sense. 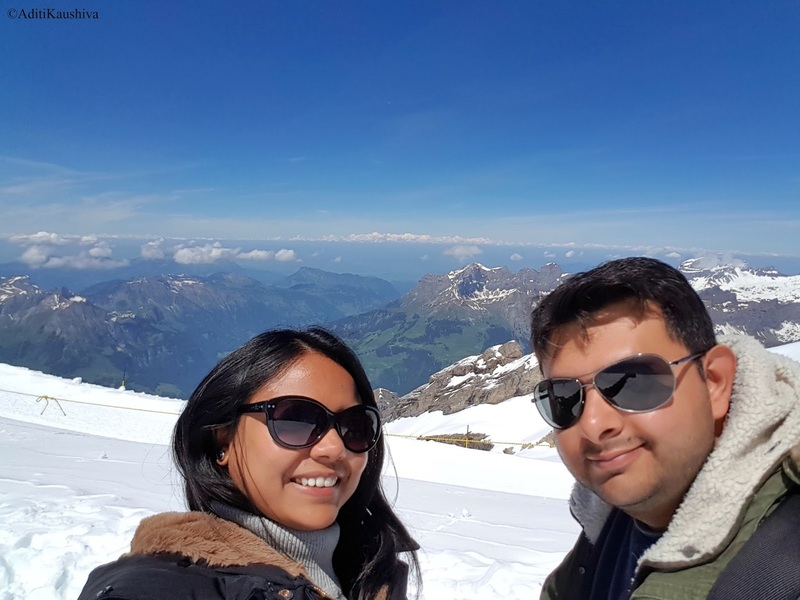 As we oohed and aahed our way up to the peaks in Rotair 360 - the world's first revolving gondola, we were upbeat and ready to jump into all the snow-clad craziness Titlis had to offer. We walked on the suspension bridge past the howling winds, sledded down the slopes in animated squeals and giggles, rode the ice flyer looking down at the nature's magnanimous splendour and almost froze inside the blue lit glacier cave. For their tiny dreams to be lived. She begged him to write her a handwritten letter. In the age where you could speak everyday, where you could run to an Internet Cafe to chat with your beloved who was miles away, she insisted on the most romantic format of communication. I have been trying to 'figure things out' for a while now. I see the dexterity I once believed to have failing me, and the multiple projects I have been juggling falling out of my hands. I like variety. 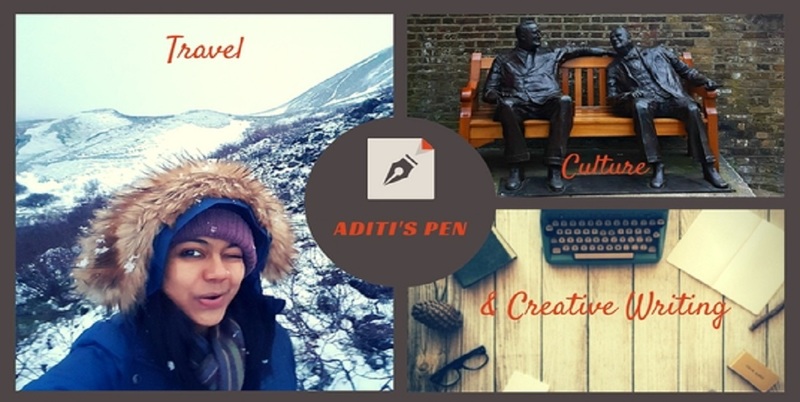 I like dabbling in blogging, writing, dancing and working on building a one of its kind dance community. All this, while in the background run my 9-5 job and my home. Is juggling everything together working? At the start of this year, I had chosen my word for 2016 as 'Focus', but the more I try, the more I feel I am falling behind. I have, on more than one occasions thought of quitting. I looked at the bedside clock. It read 5:00 am, but it was still dark outside. I closed my eyes again and listened closely to the rhythm, my heartbeat and the ice cracking, as it enveloped the empty interiors of my grandmother's wooden house. I find writing short stories really difficult, the art of creating a punch in a few words and leaving the reader with a feeling of wanting more, is a challenge. Having tried my hand at writing 55 fiction, drabble and flash fiction, I was looking forward to reading Mansi And Yuimi's well curated and impeccably designed Two Hundred - an anthology of terribly twisted short stories. 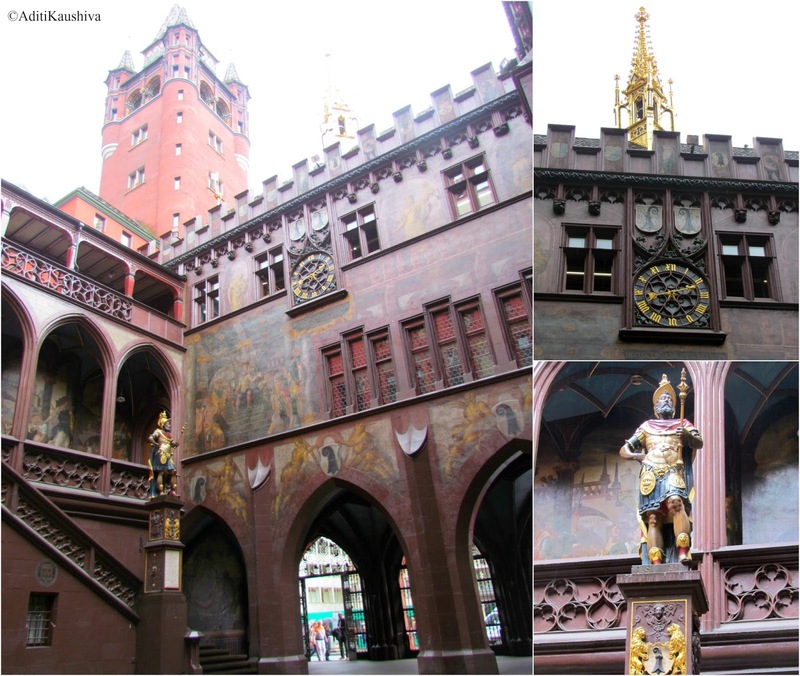 As we walked out of the airport towards the city center, the red Rathaus shined through the Basel landscape oozing history and culture. 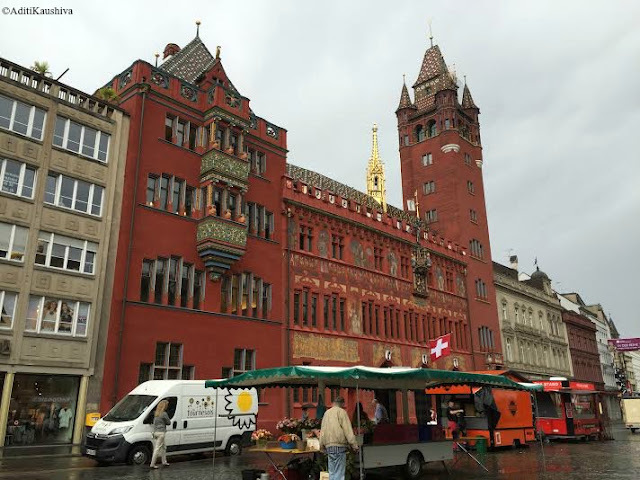 It was a wet day and we had a couple of hours in Basel before catching a train to Interlaken, so after having a deliciously hearty meal we spent our timing lazing at the banks of the river Rhine. 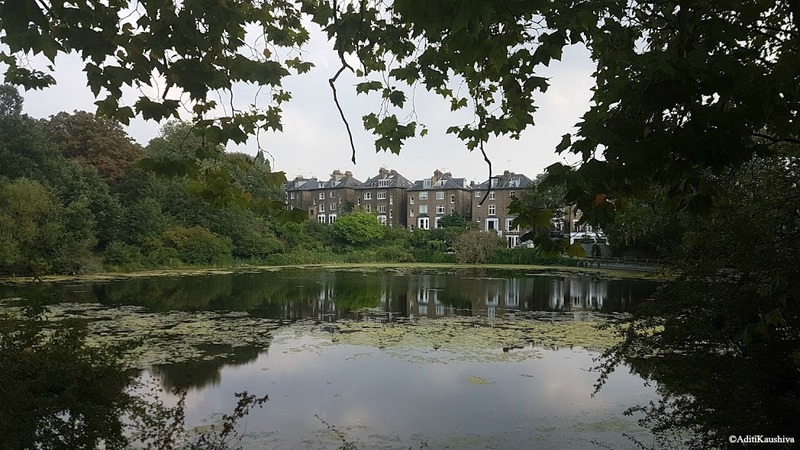 Living in London, adapting to a new country and its culture has not only made me embrace the unknown but has taught me a lot about myself and the world. When I read Maggie's 'Through a Stranger’s Eyes' which is a personal account of her life in America and how that time has shaped her personality, I couldn't help but feel an eerie connection. 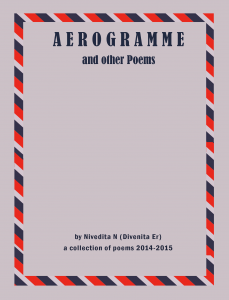 Nivedita, a fellow blogger, poetry aficionado and editor pours her heart out in 'Aerogramme and other Poems' and takes the reader on a vivid journey of memories. Memories that recapture 'everyday' moments in life. Few of them invoked a sense of nostalgia and few brought me closer to the beauty of passing moments. I was thinking I'll have something to read on my way to work, a nice book which as the blurb promised, would take me through India, Europe and USA, and give me a peek into the lives of three young people as they engage with the cultural, sexual and student revolutions, and the music of the sixties. Oh boy, I was not expecting to be turned off, so bad, so fast. I don't know how to start a review for a book that was so hard to read. Which didn't connect with me on any level despite of my honest efforts. Really, I did give it a try. For the last few months, I haven't been doing too well with my writing projects and blogging. With full time work, I feel exhausted by evening and after cooking dinner just feel like unwinding in front of the TV. We've been catching up on Game of Thrones and also binge watching on The Mentalist. Trying my best to get of out of this writer's block, I have been seeking inspiration anywhere I can find. And that's when I found Austin Kleon's newsletters and discovered how to make a newspaper blackout poem. It is lots of fun and a perfect way to use my travel time. I was a bit iffy sharing these on the blog at first, but here you go. Do let me know, what you think? April was a busy month, and a day away from chaotic London was just what the doctor had ordered. A day away from my 9-5 work routine, a day amidst nature, getting caught in the rain, playing hide and seek with the sun, rejuvenating and getting inspired by medieval history. So on a wet Saturday afternoon, instead of brooding and staying in in our pyjamas, we decided to hop on to the high speed javelin trains from St Pancras and head to the city that inspired Geoffrey Chaucer’s classic book - The Canterbury Tales. One year. Away from home. New city, new country. 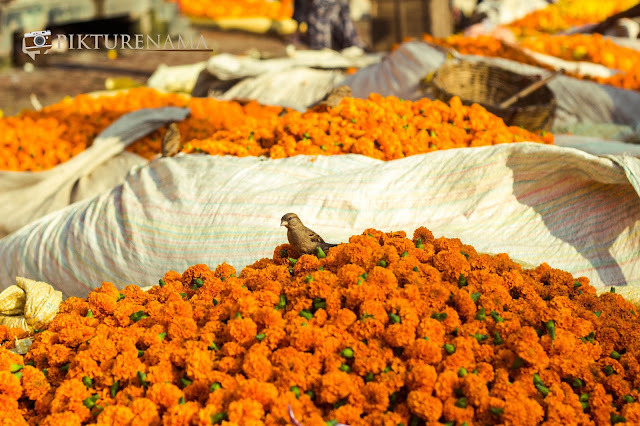 18th April marked the day we left our comfortable nests in India, gathered our belongings, our hearts, and flew to the city of London. I can't believe it is one year already. The morning after our first step in this vibrant city, I got up to new sights and smells. The spring air, the smell of freshly grounded coffee and bakes, the many heads in business suits hurrying their way into the crowd and out, the busy buskers tuned to their beloved instruments, the disheveled figures hanging on to their dreams from the night before - everything beckoned me to a new adventure. And that's what the past year has been, an adventure, a journey and on the way many lessons. Cotswold is an area in the heart of England which is characterized by the quintessential English villages, that are famous for their antique shops, pubs, tea shops, cobbled streets and pretty cottages. 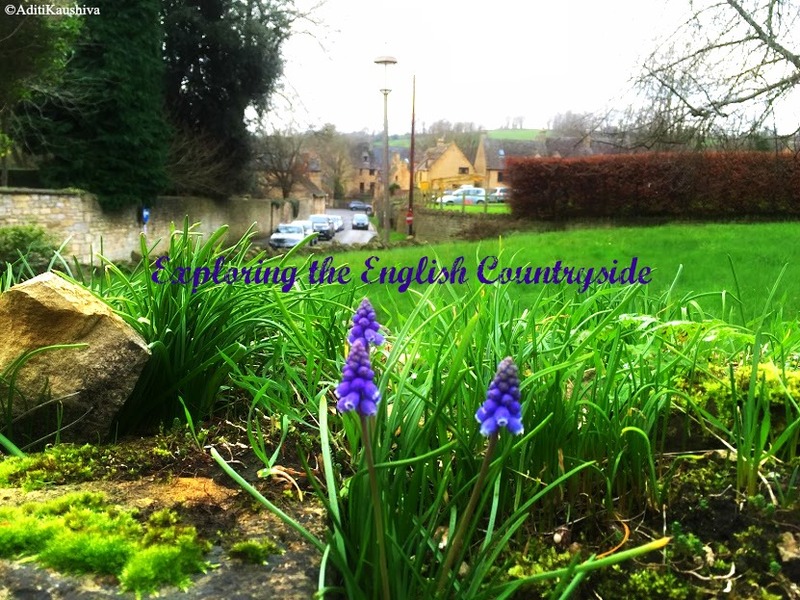 The majority of the Cotswold lies in Gloucestershire but it expands to over five other counties: Oxfordshire, Wiltshire, Somerset, Worcestershire, Warwickshire - thus making the task of exploring the entire region impossible in a single visit. In late December we set out on a short road trip to explore the English countryside and narrowed down the list of towns that we wanted to visit to - Stow-on-the-Wold, Lower Slaughter and Upper Slaughter, Burton-on-the-Water and Chipping Camden. If I can describe this trip in one word, it would be 'magical'. I felt as if time had stood still and we had been transported into a storybook. Peeking inside the golden-brown hued stone cottages, all I wanted to do was get in, sit with a huge mug of hot chocolate at the foot of a stool beside the fireplace and read a classic, like perhaps Wuthering Heights which describes the wild landscapes so hauntingly. Sigh! A lot has happened in one month. If I can gauge of what's to come by the way January has shaped up, 2016 will be a roller coaster - of emotions, opportunities and challenges. 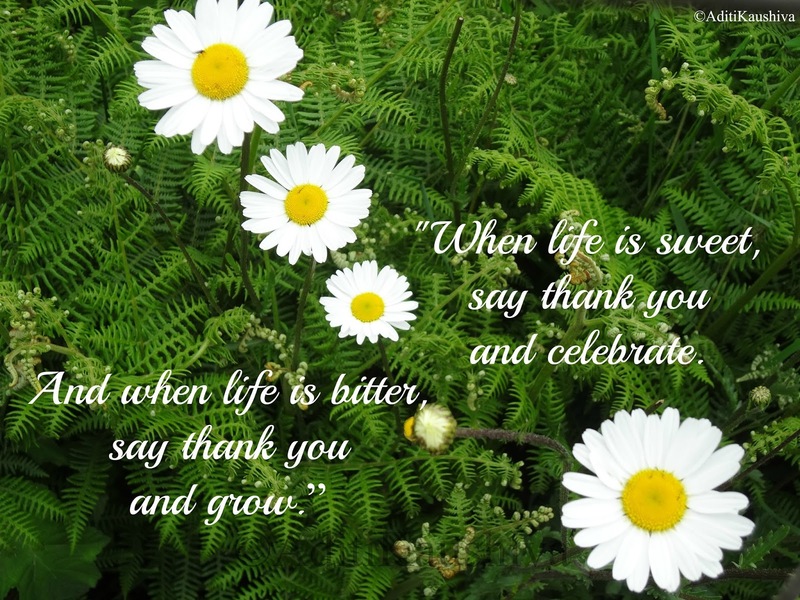 But I am grateful for it all, and that one step towards appreciation and thankfulness will help me grow. I've been keeping a gratitude journal for the last year and a half, giving thanks for the simple pleasures of life, but at times one feels the need to share, especially when you want to let someone know how grateful you are for being in their lives. Putting our best foot forward in 2016, we landed in Amsterdam on a wet windy Saturday morning. It was a breezy commute from the airport to the Amsterdam Central station but who knew the 10 minutes walk from there to our houseboat would have us soaking wet! We reached Hotelboot Angeline in that haggard state, might we add hungry too, and were immediately put at ease as Daniel, our host, welcomed us in warmly to the cozy houseboat. Staying in a houseboat in Amsterdam is an experience in itself. You can get an insight into the Dutch way of living and soak in the charming atmosphere around. Some may question this choice of accommodation, especially in winters, but let me tell you, I had the best sleep in ages on this houseboat's comfortable and snugly beds. And 24*7 hot water and heating, free Wi-Fi and a scrumptious spread of breakfast enough to keep us fuelled till late noon, made this a perfect choice for our stay.